Our product range includes a wide range of yellow dextrin. Yellow dextrin is manufactured by partially hydrolyzing Starch, using the dry roasting method in the presence of a catalyst: The dextrinisation chemically reduces the starch molecules into smaller components. Yellow dextrin has low viscosity and is very sticky and hygroscopic in nature. Used in the foundry as a binder for cores. 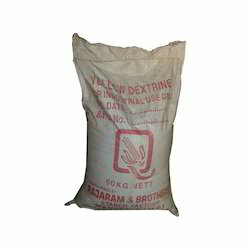 Yellow dextrin helps in increasing dry strength at the same time being completely soluble in water. This product also finds its application as a binder for mould and core washes. Its binding abilities’ make it an essential ingredient in various other applications, such as Adhesives, Gums, Pastes Pyrotechnics.